• Monday – Friday, 10 a.m. – 3 p.m.
• the 1st and 3rd Saturday of each month, 12 p.m. – 3 p.m.
All tours are offered on the hour and start in the State House Annex. Self-guided tours are not allowed at the capitol, though access to the legislative chambers to watch the proceedings is permitted. Closed Sundays and state holidays. The executive branch of the capitol is closed for renovations currently, with an anticipated opening of about 2022. The stamp for New Jersey is located in the State House Annex. This information was updated in June of 2018. I visited the capitol of New Jersey on Independence Day in route to the Independence Hall. I was very pleased with the glowing gold on the dome. 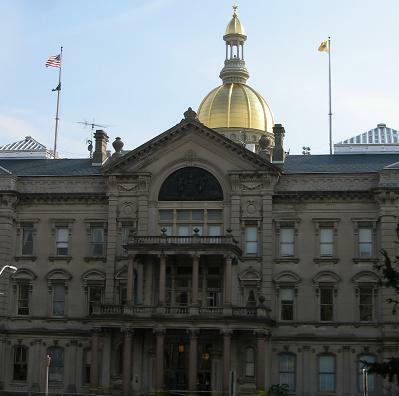 I have seen 6 state capitols in total now, 5 of which here topped with golden domes… I must say that New Jersey’s is the goldest thus far.